We spend about a third of our lives sleeping and the keeping clean the mattress we use is essential for our health. We provide high-quality mattress cleaning in Maida Vale W9 which is suitable to be used in domestic and commercial estates. Our cleaning technicians are qualified, trained, equipped with advanced machines, various detergents and solvents. They can remove stubborn stains, unpleasant odours, bedbugs and other contaminants from mattress, made of various materials. The procedures which our staff apply are done in accordance with the type and condition of every mattress. Our mattress cleaning services are suitable to be used in domestic, rented and commercial properties. 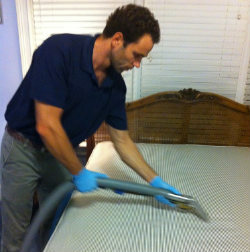 Before starting the cleaning process, our employees inspect every mattress. If there are any areas which need deeper cleaning they pre-treated them using the proper preparations. Our cleaning technicians remove stubborn stains from the mattress using appropriate detergents and sprays. After that, they apply steam cleaning to disinfect the mattress in depth. We use powerful steam cleaners that work by injecting mild cleaning solution in the mattresses. Then the dirt, allergens and contaminants are extracted with the machines along with the moisture, left in them. The hot water extraction which we provide ensures clean, dry and deodorised mattresses. After completing all cleaning procedures, our technicians spray the mattresses to deodorise them. You can count on them to ensure you excellent mattress cleaning in or near Maida Vale, done at reasonable prices. Every mattress should be sanitised in depth once every six months to be in healthy condition. Regular mattress cleaning ensures the longer usage and better condition of the mattress. Get in touch with our customer support centre to schedule the mattress cleaning which we provide within W9 Maida Vale and keep the healthy condition of your beds.